We must do more to educate the next generation and ensure destiny is not determined by zip code. Governor Greg Abbott and Texas A&M today announced that Kenneth Ramos, MD, PhD, PharmB, will be joining the Texas A&M University Health Science Center in March through the Governor’s University Research Initiative (GURI). EducationSuperHighway today released their annual State of the States report outlining Texas' progress in improving connectivity to high-speed internet in schools. Governor Greg Abbott today visited Dallas, Texas, where he hosted his second roundtable discussion focused on improving education across the state. Governor Greg Abbott today held an education roundtable in New Braunfels, Texas, aimed at developing ideas to improve education across the state. Governor Greg Abbott today announced the University of Texas at Arlington and Texas Tech University as recipients of Governor's University Research Initiative (GURI) grant awards. 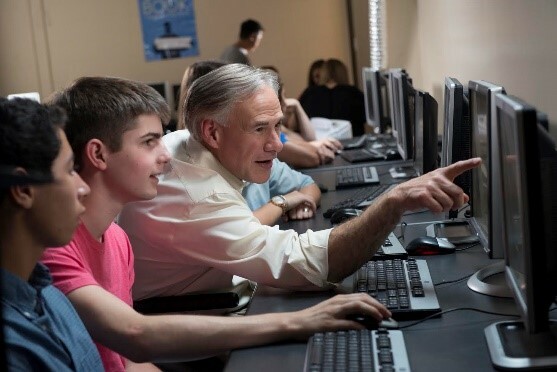 Governor Greg Abbott today visited Briarhill Middle School where he joined students and local leaders for the NASA In-Flight Education Downlink. Governor Greg Abbott today sent a letter to Texas Education Agency (TEA)Commissioner Mike Morath directing him to take immediate steps to prepare an initial corrective action plan within the next seven days to reform special education in Texas.